During a press conference today in Germany, Tesla CEO Elon Musk confirmed that Tesla is in talks with “some [auto] manufacturers” to share the Supercharger Network. In the past, Tesla confirmed being opened to the idea of sharing its extensive network of fast charging stations, which now operates over 2,900 chargers at over 500 locations around the world, but until now, we couldn’t confirm that any automaker showed interest in the offer. The Tesla Superchargers are the fastest DC charging stations in world with a charging rate of 135 kW for the most recent stations. The battery packs of most electric vehicles in production today cannot receive that much power, which is a requirement for Tesla to allow other manufacturers to use the network. Electric vehicles using the stations must be able to charge at high rates in order for charge times to be quick and keep the charging stalls open. An average Tesla Supercharging station can add 170 miles of range to a Model S in about half an hour, making it ideal for long distance driving. While Tesla offers battery pack options from 70 to 90 kWh, most electric vehicles today have smaller battery packs ranging from 15 to 35 kWh. Trying to charge a small battery pack with a Tesla Supercharger would be like trying to fill a shooter glass with a water pressure washer, which is not a good idea. We are actually in talks with some manufacturers doing just that and it will be exciting to share that news. 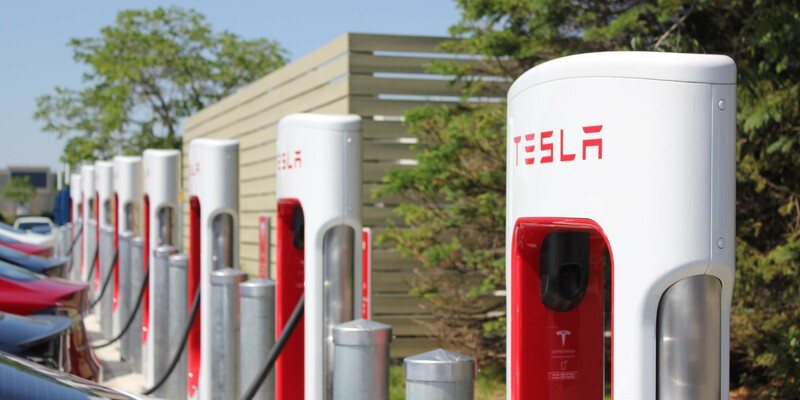 Tesla owns and operates all of its Supercharger locations and would only ask of other manufacturers to contribute to maintenance and electricity costs based on the usage of their vehicles on the network.